Endodontics (also known as Root canal treatment) is a procedure that is needed when the nerve supply of the tooth (also known as pulp) has become infected. This can be caused by decay or trauma to the tooth. Repairing such teeth by performing a root treatment can be challenging; having said that, saving a tooth from the bin is even rewarding. As far as the patient is concerned, the procedure itself under good anaesthesia is pain-free but may require a couple of visits to complete [click on image below to enlarge]. When a tooth is incurring endodontic problems, you may not even realise that there is an infection because the damage can be painless. When you look in your mouth you are only seeing the crown of the tooth whereas the the roots remain hidden beneath the gum line. As the infection progresses it starts to spread to the Root Canal System and this can then cause pain or an abscess (gum boil). 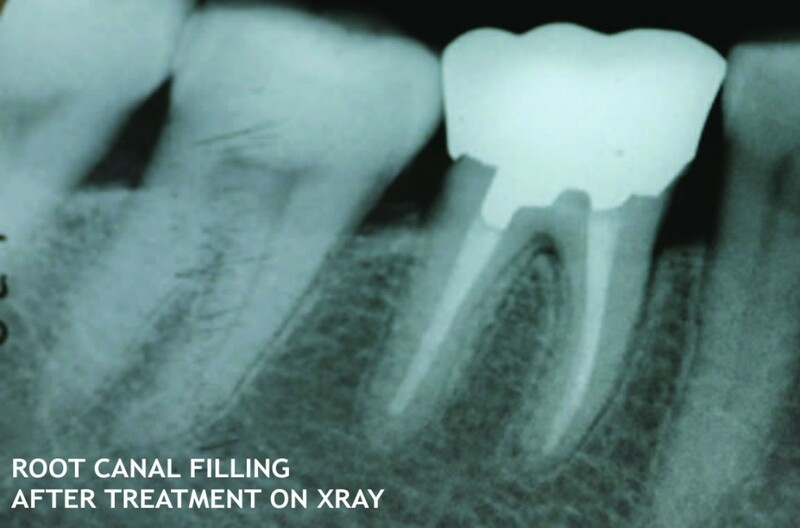 In an RCT, the objective of your first appointment is simply to remove the pulp and any infected material. Thereafter, the tooth is then cleaned and shaped ready for the next appointment to be filled. At the next appointment, the tooth is simply checked to ensure that all the infection has gone and then it is permanently filled. The last stage of root canal treatment, the filling that you normally see, may be anything from a metal amalgam/composite tooth-coloured filling to a full-coverage crown. Again, your dentist will be able to advise you what is best. 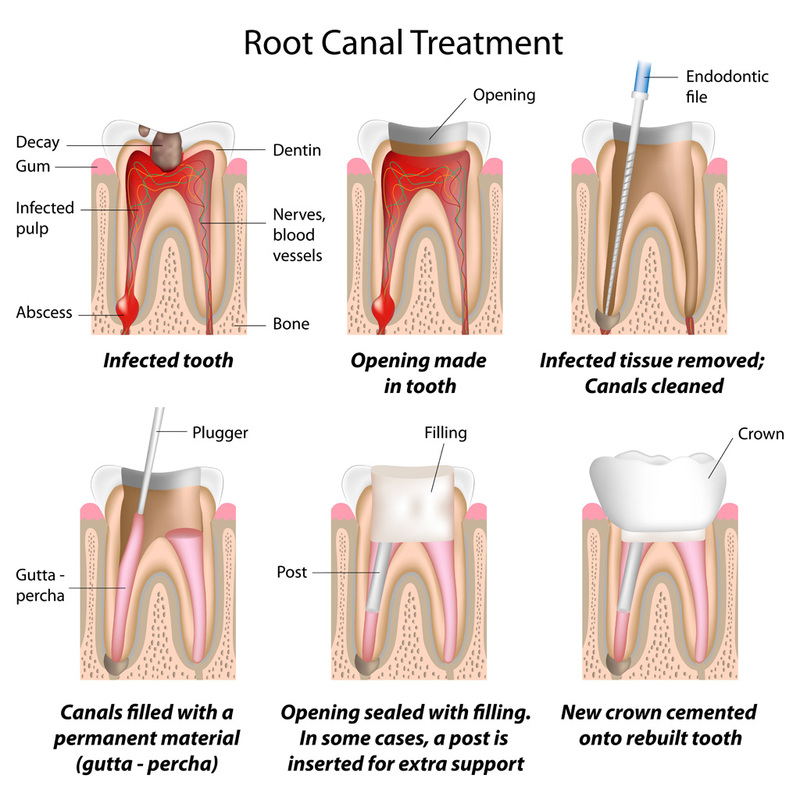 In general root treatment is usually successful at saving a tooth and removing infection. It is a great cost-effective procedure and is worth the time it takes to complete rather than going for the quick option and losing a tooth. However if the infection cannot be cleared ore or returns constantly, the RCT may be repeated or consideration given for an extraction. If you have any other questions regarding root canal treatment we have created a video which can be viewed here or alternatively give us a phone today on 0141 445 1829! You can also book on-line here. Free check-ups available from the NHS for all patients in Scotland. Can’t make it during office hours? Late nights available. Our practice is perfect for children and welcomes nervous patients. We are open from from 9:00 am – 1:00 pm every Saturday. In the event of a dental emergency outwith these hours please contact NHS 24 on 111.